When you think of England, what comes to mind? Big Ben? Buckingham Palace? The Tower of London? What about Westminster Abbey? If you have ever dreamed of taking an affordable vacation to England, the Abbey is a must see. Assisted by King Edgar, Saint Dunstan installed a community of Benedictine monks at the site of Westminster Abbey somewhere between 960 and 970. Then, between 1042 and 1052, King Edward the Confessor began rebuilding St. Peter’s Abbey to provide himself with a royal burial church. He would die just a week after the Abbey was finally consecrated in 1066. While Edward’s successor, Harold II, was probably crowned here, the first documented coronation is that of William the Conqueror. The Abbey has been the coronation church ever since. The construction of the current church – Westminster Abbey – began in 1245 by Henry III, who selected the site for his burial. To date, the Abbey is the final resting place of seventeen monarchs. This largely Gothic church in the City of Westminster, London, just west of the Palace of Westminster, is one of the most notable and recognizable religious buildings in the United Kingdom. In 1539, Henry VIII assumed direct royal control and granted the Abbey the status of cathedral in 1540, a distinction it held for only 10 years. However short, the status of cathedral saved Westminster Abbey from certain destruction when Henry VIII inflicted destruction or dissolution on most English abbeys during this time. The Abbey was later restored to the Benedictines by Mary I of England in 1559, before again being established as a Royal Peculiar in 1579. Because of this, the Abbey is not actually an abbey at all as it no longer houses monks. The last abbot became the first dean of the Collegiate Church of St Peter. 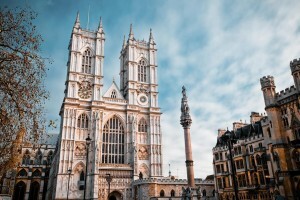 Today, Westminster Abbey is a favorite of tourists for its iconic Gothic architecture, beautiful collection of paintings, breathtaking stained glass, textiles, and other artifacts. AESU, the most trusted name in travel, offers unique, exciting travel programs for college students and young professionals at affordable rates. Each trip is action-packed and informal—designed just for people your own age. Our Cosmopolitan, Explorer, Euro Focus, Great Escape, and Euro Spree tours all visit England. Best of all, each trip is incredibly affordable. Each trip is action-packed and informal—designed for people your own age. If you have any questions about Westminster Abbey or any of our Affordable European Vacations, please contact AESU by calling 800-638-7640 or fill out the contact form found on our website. And don’t forget to check out all of our great Travel Tips, especially the Travel Tips for Europe, before you head overseas. This entry was posted on Thursday, July 24th, 2014	at 2:03 pm	. You can follow any responses to this entry through the RSS 2.0	feed. Both comments and pings are currently closed.